In 2009 Rebecca Schacker purchased a foreclosed home in the Foster-Powell neighborhood. In many ways, the house that would become the Apex Wellness Center was an unusual choice—it was a neighborhood eyesore with a backyard full of weeds and usually a few discarded fast food wrappers as well. But she saw its potential and decided to purchase the property. Then Rebecca applied for, and six months later received a property rehabilitation loan from the Portland Development Commission, along with other grants. 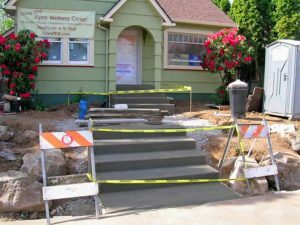 After a lot of hard work and some visionary thinking, Apex Wellness Center would open its doors to its first patients in July 2010, and eventually the business would also be awarded both a Sustainability at Work Gold Certificate for 2012 – 2015, and a platinum Certified Backyard Habitat, an award usually given solely to residences, not businesses. The finished building includes five treatment rooms, an ADA accessible bathroom and entryway, off-street bike parking and a yard landscaped with native plants. The story is really a “best practice” case study for any new business that wants to become part of a community, not just another storefront. The Apex house still maintains the outer look of a 1920s era bungalow, but inside all systems have been replaced and updated to maximize efficiency. During the extensive reconstruction process the house underwent numerous modernization updates. Apex hired a green certified contractor and a vast majority of the original wood flooring was able to be uncovered and refinished. Reusable items were donated to the Rebuilding Center, scrap wood and metal from the demolition stage were recycled, and recycled paint was used for all interior walls. Old insulation was pulled out and replaced with new better quality insulation. Only one original window from the old house remains in place; all others were replaced with double pane units. Drafty entry and exit door were replaced. The 1980s era furnace was replaced with a high efficiency furnace. The old water heater met a similar fate and was replaced with an on-demand water heater. The yearly average total natural gas usage at Apex is approximately 150 therms—a similar house without all these energy efficiency improvements could easily use 500 therms. This constitutes approximately a 70% reduction in energy consumption. Apex has also installed a 4.48 KW solar panel system, which should save about 7,000 pounds of carbon a year. That’s roughly equivalent to driving 7,000 miles. Apex’s commitment to energy efficiency didn’t end when construction was completed. Compact fluorescent light bulbs are used in all fixtures; lights are turned off when an area or room is not in use; outside lighting is on timers; and the refrigerator, washer and dryer are all Energy Star models. Apex also uses PGE Green Source Energy. The window treatments are double cell blinds, which further help to insulate the facility. When remodeling the house, Rebecca didn’t forget about the needs of her future employees. The remodeled kitchen allows employees to bring in their own lunches and the full shower facility and cubbyholes encourages practitioners to cycle to work—sweaty lycra just isn’t compatible with the cleanly professionalism required in a healthcare clinic. 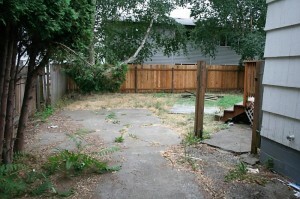 When Rebecca purchased the foreclosed house, the large backyard was part of the package. Rebecca enlisted the help of local landscape designer Kathryn Leech of River City Gardens. The backyard is now a cornucopia of native shrubs, trees, perennials and grasses. The lawn is an ecolawn, a mixture of grasses, flowers and herbs that doesn’t require as much water or mowing. The concrete driveway was replaced with a walkway made of permeable pavers that allows water to soak into the soil, not flow into the sewer. Rain gardens and bioswales are also incorporated throughout the yard. The yard stays green throughout the summer months with less water and little to no fertilizer. That neighborhood eyesore with the trashy yard is now a valuable addition to the Foster-Powell neighborhood, and an example of how transformation is truly possible.